It isn’t rare that a freelancer encounters this all-too-familiar internal conflict: how does one price one’s freelance services? Admittedly, putting a price tag on your work--whether it’s hourly or on a project basis--can rouse up a lot of doubts about one’s worth. To anyone who closely ties their work with their sense of self, assigning a monetary value to their livelihood puts into question how much one’s blood, sweat, and tears really cost. Sometimes though, the problem is less crisis of self-worth and more “I seriously just don’t know how to do this pricing thing”. This is especially true for beginner freelancers who are perhaps yet too sheepish to ask for a good price to their services. This is why it’s important to know the rate of your bottom line by asking one very important question: What’s your Minimum Acceptable Rate? LeavingWorkBehind’s Tom Ewer gives awesome advice on how to calculate your freelancing rates: identify your Minimum Acceptable Rate, or MAR. This is the baseline of the project rates you’re willing to work for. Personal overheads should cover your living expenses in a month or year, like paying for your food and house. Meanwhile, business overheads should cover the amount you spend to maintain your business in a month or year (your internet connection, your electrical bill, gadgets, etc.) Divide this amount by the hours you project to work for the month or year. After you get the total, add taxes on top. Say, you spend 50,000 pesos to pay for your rent, food, water, and groceries every month. That would be your personal overhead. For your business overhead, add an extra 5,000 pesos for your electricity and phone bills every month. That brings the overheads amount to 55,000 pesos. Now divide that with the hours you project to work in a month. Let’s say you only plan on working 6 hours a day, 5 days a week. In one month, that’s 120 hours. When you divide 55,000 pesos by 120 hours, that’s roughly 459 pesos. If you peg your taxes at 12% (assuming that you’ve not registered yourself as a Barangay Microbusiness Enteprise), then your Minimum Acceptable Rate would be at 515 pesos per hour. This should be taken on a case-by-case basis, depending on your work. Tom advises against pricing per hour, saying it limits your earning potential, and also clouds your client’s judgment. Simply put, you can clock in as many hours to complete a task, but as a freelancer, you’re not being paid to warm your seat. You are being consulted for your expertise. Why should you be judged to how much time it takes to complete the project, than how awesome you can deliver it with the quickest turnaround time? If you’re eager to learn more techniques on pricing yourself well, top online jobs website Freelancer.com and premier workshops organizer Manila Workshops has organized an upcoming #TalinoTalks workshop with you in mind. 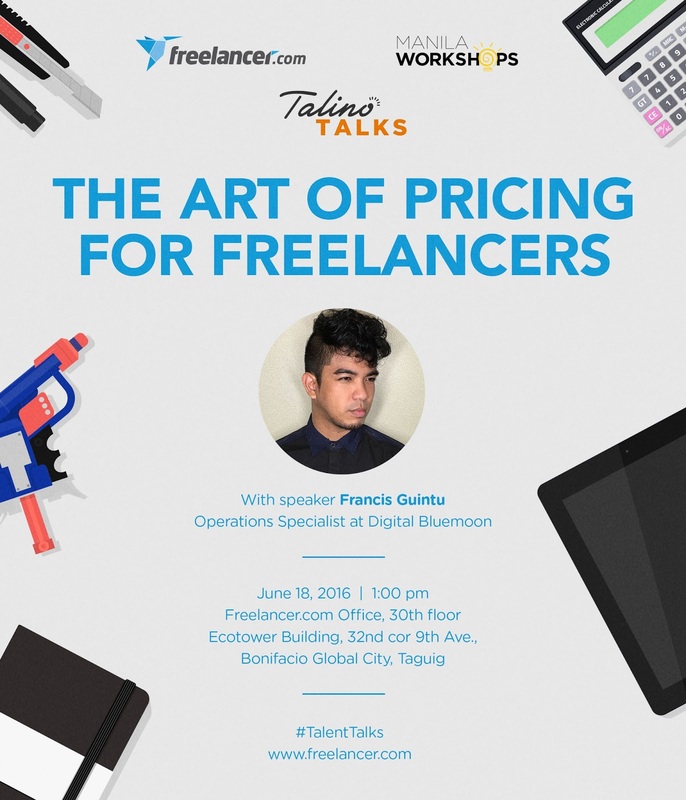 On June 18, 1 pm, join the Talino Talks workshop “The Art of Pricing for Freelancers”, with speaker Francis Guintu from the Online Filipino Freelancers community. Hmm.... do you pay taxes? I mean is your worked being taxed at all? Just curious. My friend is a freelancer and she got this sort of social security number for enterprises. I don't know what it's called in the Philippines. Anyway, she has lots of taxes to pay. I advised her to find a lawyer how can help her with loopholes or go underground and don't declare anything at all. Im not a freelancer as of now but from friends i heard that they do have taxes but you have to fix it yourself, so an underground ways or not declaring at all is possible. Nice tips Steve. This reminded me of an incident where an advertising firm asked to use a photo on my blog for an advertising campaign. I didn't know how much should I place on the photo so I gave them a very high amount. They didn't accept my offer. The time duration, exact time of the call, and even if you want a recording to the called Toll Free Numbers. It is available with them regarding any trouble shooting.